Just a short postscript to my earlier post on Carl Hofer. 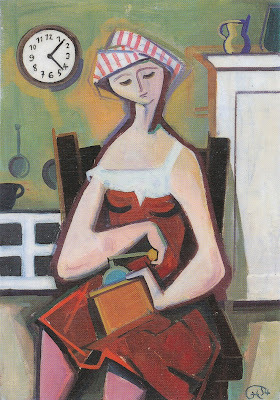 I have found the kitchen painting I’d been looking for: Girl With Coffee Grinder from 1954. My memory for once hasn’t betrayed me, it’s a touching painting full of worldliness. Stylistically it is obvious that Hofer took his cue mostly from the late efforts of the French old masters of classical modernism, to try and loosen himself up a little. Contentwise, this is oh so literal, right down to the clock: Darn it we’re late already, coffee hour is 4pm sharp in this household. Ah, what is the silly girl dreaming about again. If one considers the turf battle Hofer was involved in during these years, one might expect every single painting from him would read like a manifesto. He was busy fighting an “obsession with innovation that had taken on the form of a sickly hysteria serving nobody except the vain craving for recognition of the so-called avant-gardists.” (Thoughts On Abstract Art from that same year, 1954.) He viciously (in post-war Germany) equaled being part of the current art movements with blindly following “the party.” In an interview with a glossy, the 75-year old director of the Berlin Art Academy confessed, “When I found out how easy non-figurative painting was, I quickly lost interest in the genre,” which lead to quite a storm in the tea pot with several colleagues leaving the German Künstlerbund in protest. And Hofer backs it all up with a dreamy coffee grinder in a funny nouvelle vague hat, the gratuitous amount of her visible undergarment suggesting that he’s playing a sickly bourgeois and repressedly wanton Greuze to Picasso’s Fragonard. Which is a good thing for one single picture. The first commercially released electric coffee grinder hit the German market two years later and was a smashing success right from the start.